This Case is designed specifically for the Raspberry Pi 3b+ and cannot be used on other boards of the Raspberry Pi. We made a lot of optimizations and upgrades for the Raspberry Pi 3b+ motherboard change, all the holes are consistent with the Raspberry Pi 3b+ interface. The Case with acrylic layers is more durable to protect your Raspberry Pi board, each accurate port can perfectly connect your output devices, easy to insert/remove sd card, allows cobbler cable, camera cable and other GPIO connectors access. 2.5A is now a requirement for the Raspberry Pi. This Power Supply differs from typical standard 5V USB power supplies in the market in that it can deliver a full 2.5A and still output a voltage well within the USB minimum voltage specifications. The Micro Cable is 5 Feet Cord Length, so it is long enough, and the Micro Cable with ON / OFF Switch , so it is no need to pull the cable to restart or reboot your PI, just press the button to turn your Pi on and off. We also present a T Type GPIO Breakout board and 40 Pin Rainbow Cable,which is Specifically for expansion of the GPIO for Raspberry Pi 3 b+,So you don't have to pay extra to buy these accessories. ♥ Double Cooling ♥ - Fan is quiet when pi running, and Quick cooling the LAN/RAM with 2pcs Aluminium heatsinks. ♥ Case with Precise Ports for Pi 3 b+ ♥ - Each accurate port can perfectly connect your output devices, Easy to insert/remove sd card, allows cobbler cable, camera cable and other GPIO connectors access. ♥ 5V 2.5A Power Supply with On/Off switch ♥ - Easy to control pi charging with On/Off switch, 2.5A Power adapter meets pi 3 b+ power expectation, avoid the pi reboot by insufficient power supply. 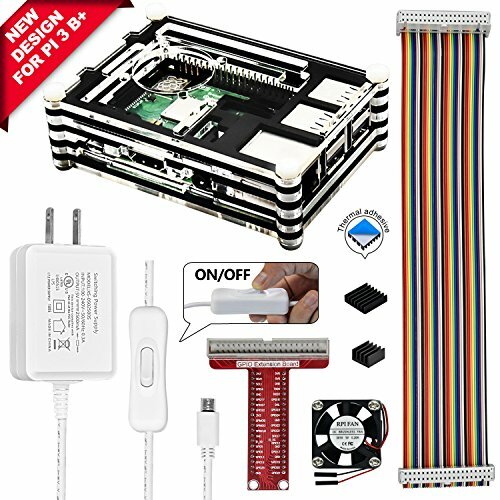 ♥ Lower prices, More accessories ♥ - Come with T Type GPIO Breakout board and 40 Pin Rainbow Cable,Specifically for expansion of the GPIO for Raspberry Pi 3 b+. If you have any questions about this product by REXQualis, contact us by completing and submitting the form below. If you are looking for a specif part number, please include it with your message.